I was recently learning some new software, and I realized that technology can aid me in my sewing room in more ways than just having a computerized embroidery sewing machine. You can scan­—or take digital photos of—the front and back of pattern envelopes, then sort them into electronic folders in your computer. View the pictures as thumbnails so that you can see, at a glance, what’s in your pattern collection. You can even print out these files to display many patterns on a single sheet of paper. Paste the thumbnail sheet on the front of your storage box to indicate its contents. 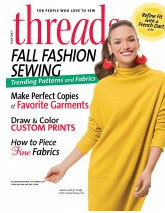 It cuts down on time spent searching through boxes of patterns.